What is the proper name for that sweet sugary mixture used to fill and cover cakes, pastries and other confections? The answer may depend on where you live. Americans tend to use the word 'frosting'. Other countries tend to use the word 'icing'. The name 'icing' probably has something to do with the fact that 'confectioners' or 'powdered' sugar is also known as 'icing' sugar. Hence, combining icing sugar with other ingredients makes an 'icing'. The fact is that 'frosting' and 'icing' are the same thing and food writers used them interchangeably. 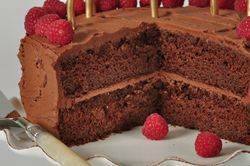 There are numerous types of frostings (icings), both thick and thin, cooked and uncooked, starting with a simple mixture of powdered sugar and water, to beating hot sugar syrup into stiffly beaten egg whites, cooling and then beating in softened butter to make what is called an Italian Buttercream. What is important in deciding what type of frosting to use is to match the icing to the baked good. That is, the icing should complement the flavors and texture of the dessert being frosted. For example, a cinnamon bun (roll) is wonderful drizzled with a simple icing of powdered sugar and milk but this would not be suitable for frosting a chocolate butter cake. A rich buttercream will perfectly complement a butter cake, but might overpower a delicate sponge. Also, the frosting used to fill the cake can be different from what it used to cover the top and sides of the cake. A white butter cake is lovely when filled with lemon curd and raspberry pur? and then encased in white buttercream or confectioners frosting. It is very important that the frosting be the proper consistency so it spreads easily over the baked good, yet at the same time adheres to the surface. Never frost a cake or any other pastry that is still warm as the frosting will melt into the baked good or become too thin and run. Also be sure to brush all loose crumbs from the baked good before frosting to ensure a smooth finish, as you do not want your finished product to be laced with crumbs. Some soft cakes benefit from first covering the cake with a very thin layer of icing (called a crumb coat), letting it dry, and then frosting. Oftentimes those soft and delicate cakes, besides being crumb coated, need to be frozen first before frosting so they won't fall apart. Just make sure you defrost the frosted cake before serving. Buttercream is a name that encompasses a broad range of icings that can differ by person, city, region, or country. They can be quick or complicated to make depending on whether they are cooked or uncooked. Buttercreams may contain powdered sugar, white granulated sugar, whole eggs, egg whites, egg yolks, unsalted butter, shortening, milk or cream, pastry cream, fondant, and various flavorings (extract, pur?, chocolate, liqueur). Generally, buttercream is a light and creamy smooth icing used to fill, frost and decorate (flowers, leaves, etc.) all kinds of cakes and pastries. Some cooked Buttercreams are meringue-based where unsalted butter is beaten into firmly beaten egg whites that have had hot sugar syrup added to them. This produces a rich, yet light buttercream. French Buttercream contains both whole eggs and egg yolks that have been beaten, to which a sugar syrup is added and then unsalted butter. Confectioners' Frosting is an uncooked buttercream icing that contains powdered (icing) sugar, unsalted butter, milk and flavoring. Ganache is both a frosting and a glaze and is widely used in the pastry kitchen. When barely warm and liquid ganache is poured over a cake or torte for a smooth shiny glaze. If cooled to room temperature it becomes a spreadable filling and frosting. Refrigerated ganache can be whipped for fillings and frostings or formed into truffles. Ganache that is whipped with soft butter is called ganache beurre, which is like a buttercream, and is used for fillings and frostings for cakes. Royal Icing was traditionally used to ice Wedding and Christmas cakes and consists of powdered (icing) sugar, egg whites or meringue powder and water. (If you are worried about salmonella use the royal icing recipe that contains meringue powder, not raw egg whites.) This pure white icing when dry produces a perfectly flat, smooth and glossy hard surface which makes it ideal not only for frosting cakes and cookies, but also for intricate piping of decorations (flowers, borders, lettering, etc.) You may have to adjust the water and sugar used depending on whether you are using the icing for decorations (fine lines, outlines, etc. needs a thinner icing) or to coat cakes or cookies (thicker icing). In my opinion this is not the greatest tasting icing and is best used only when you need that smooth and glossy hard surface. Whipped Cream Frosting is a great recipe that can be used to fill and frost any type of butter or foam cake. Cocoa powder can be added to make chocolate whipped cream or raspberry pur?/font>e can be added for a wonderful fruit flavored whipped cream.